The DHQ spokesman, Col. Onyema Nwachukwu, in an interview with newsmen, said the military and police were given �marching orders�, and had carried out a re-evaluation of their efforts against the bandits as well as the next line of action. Nwachukwu stated, �The leadership of the Armed Forces of Nigeria, under Gen Abayomi Olonisakin, the Chief of the Defence Staff, and the police have met and the meeting was to identify gaps in the operations and how to address those issues. 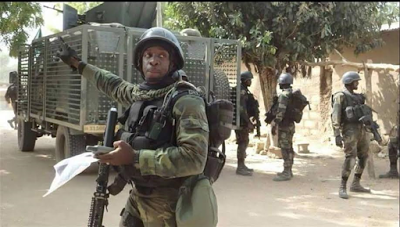 �The special joint operation is already in the pipeline with specific deployments expected from the army, the air force, the navy and the police, even with contributions from the Department of State Services, and the Nigerian Immigration Service,� the source added. The police spokesperson, Mr Frank Mba, said this in an interview with newsmen. He stated, �What we require to permanently put an end to this menace is a broad-based action with intervention at multiple levels by multiple agencies. We are leading the charge at the security and law enforcement level while we expect support at the political level from the state and local government levels, religious level and traditional institution as well as socio cultural level. �The present leadership of the force is already adopting community policing strategy as one of its main strategies for combating not only banditry but other forms of crime and criminality. That is why the Inspector-General of Police, Mohammed Adamu, has been on tour of the affected areas. The IGP was in Birni Gwari, in Kaduna, he was in Zamfara, Sokoto and Katsina within 72 hours. �We believe that the Nigeria Police, acting alone all by itself, certainly will not be able to win the war. We need to bring on board more relevant stakeholders and that is what community policing is all about. I want to appeal to Nigerians to be patient and provide us with relevant support. I acknowledge the fact that this is a challenging time but the challenges are certainly not insurmountable.